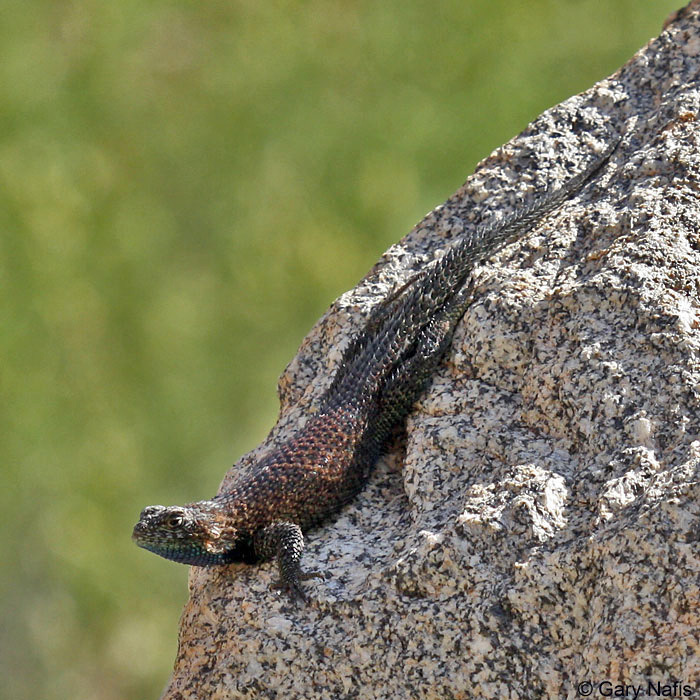 Adult female, Riverside County, in typical large granite outcrop habitat. 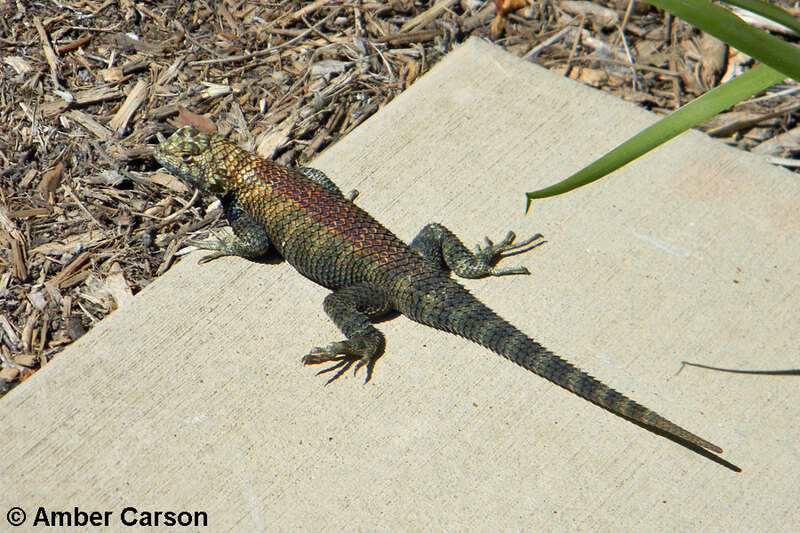 sharp spines on its back. 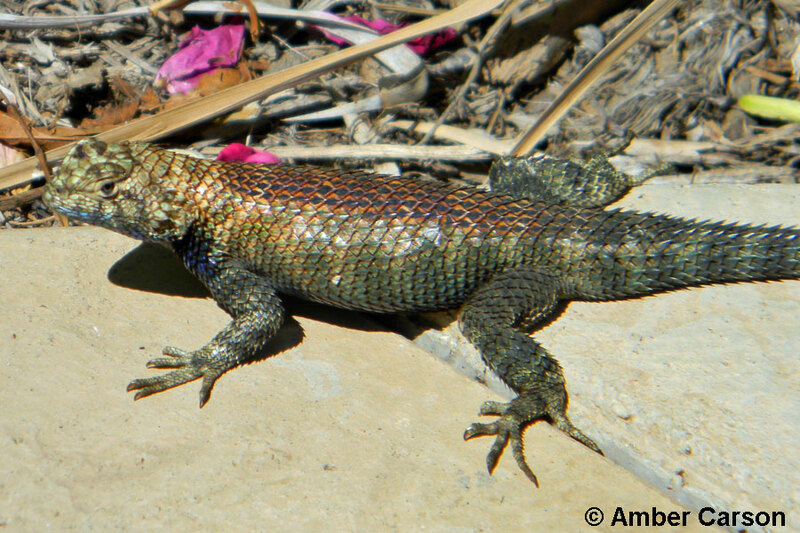 A male Granite Spiny Lizard moves over to a female who is basking on a nearby rock and presents himself to her. 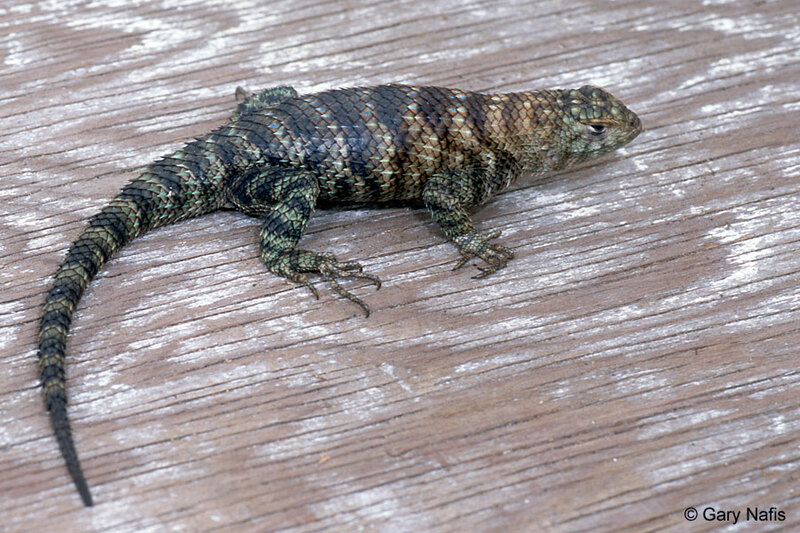 She's not interested and slowly moves away from him with her back and tail slightly arched then does some push-ups. 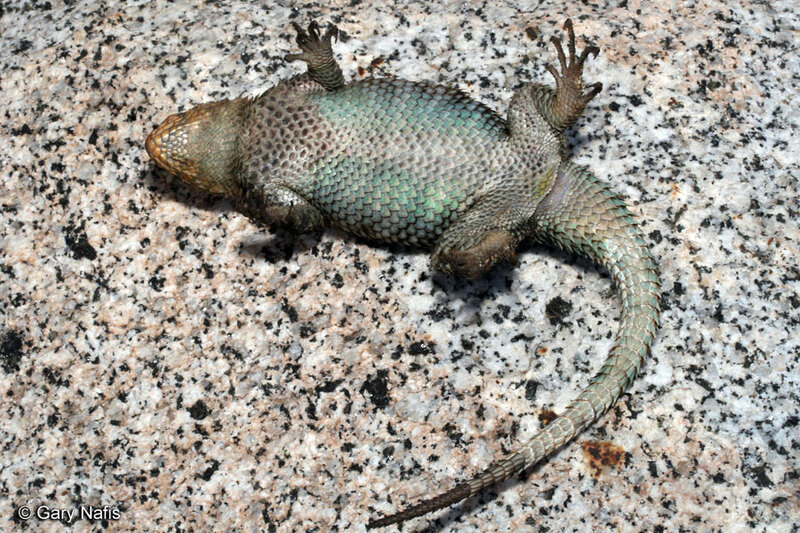 He retreates and does some push-ups. 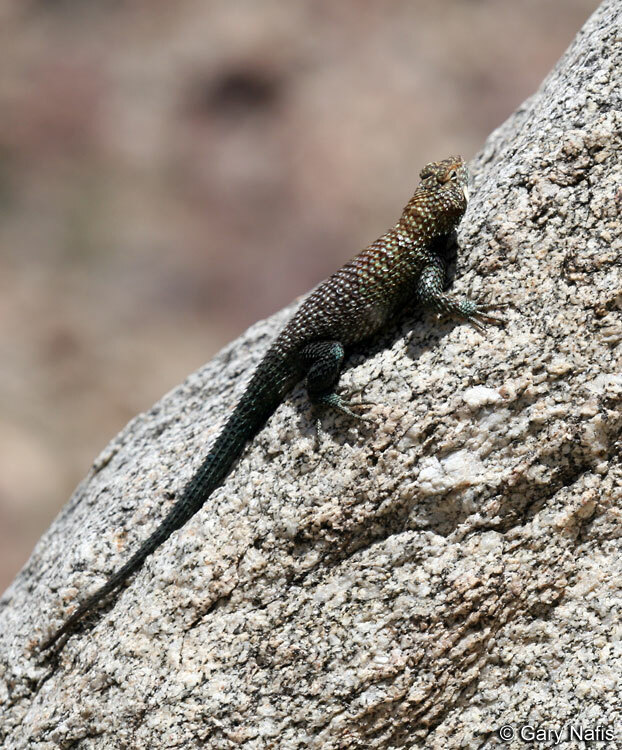 A Male Granite Spiny Lizard (the same guy as the one to the left, a few minutes after that video ended) does his territorial push-up display, lifting his body high off the rock, pausing briefly to eat something with his big pink tongue. 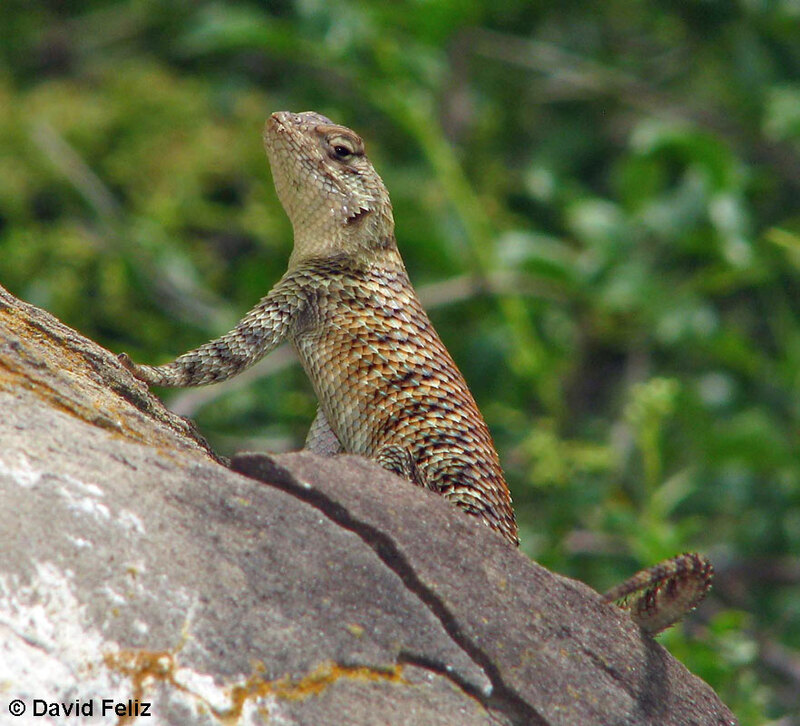 Several adult lizards are shown in various rocky habitats. 3 1/4 - 4 5/8 inches long from snout to vent (8.2 - 11.7 cm). (Stebbins 2003) Up to nearly 11 inches in total length. 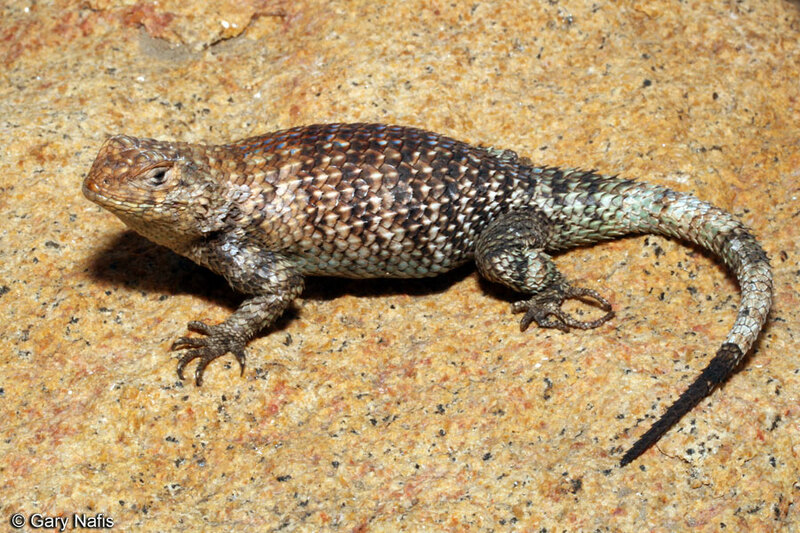 A large, dark, lizard with large pointed keeled scales. 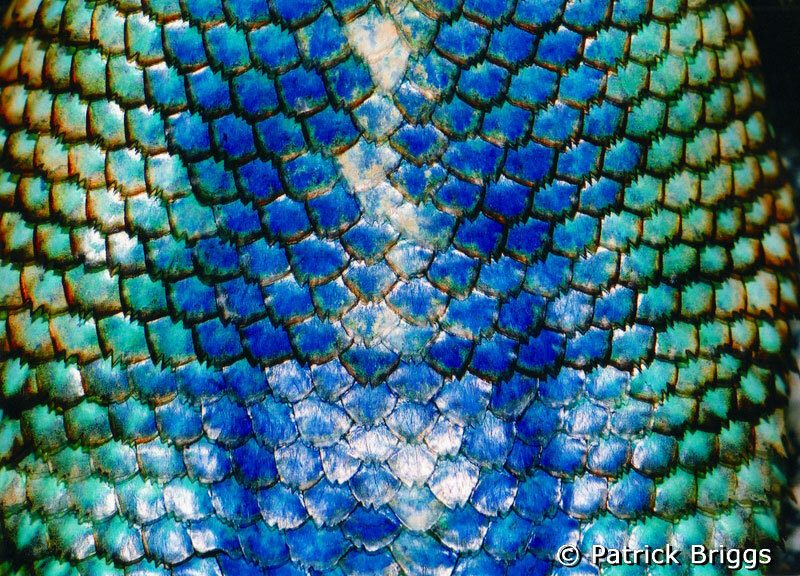 Scales are more stronly keeled on the tail, giving it a more prickly appearance. 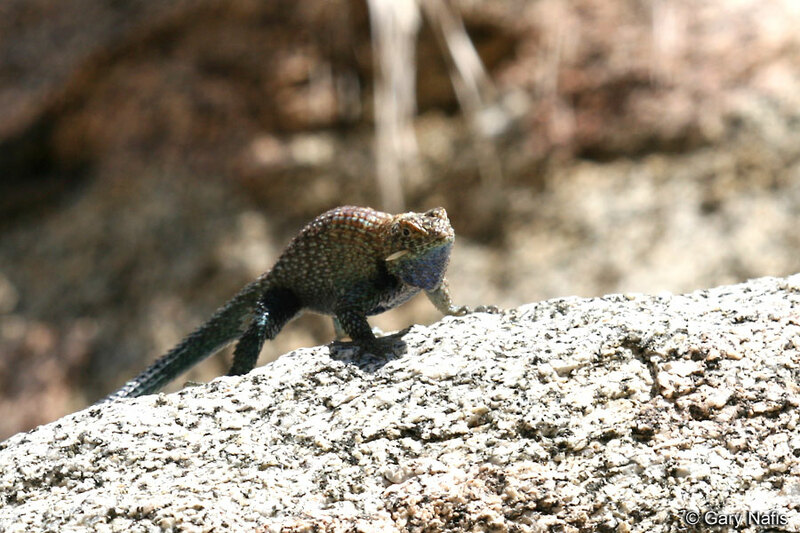 There is a dark triangular wedge on the sides of the neck and dark bands across the body. 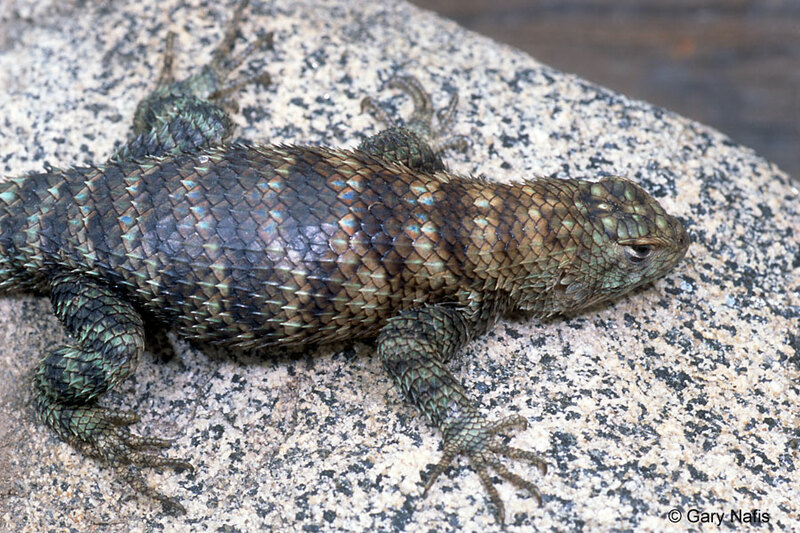 These dark markings are often obscured by the dark coloration of the body when a lizard is in its dark phase and the body color matches the dark markings. 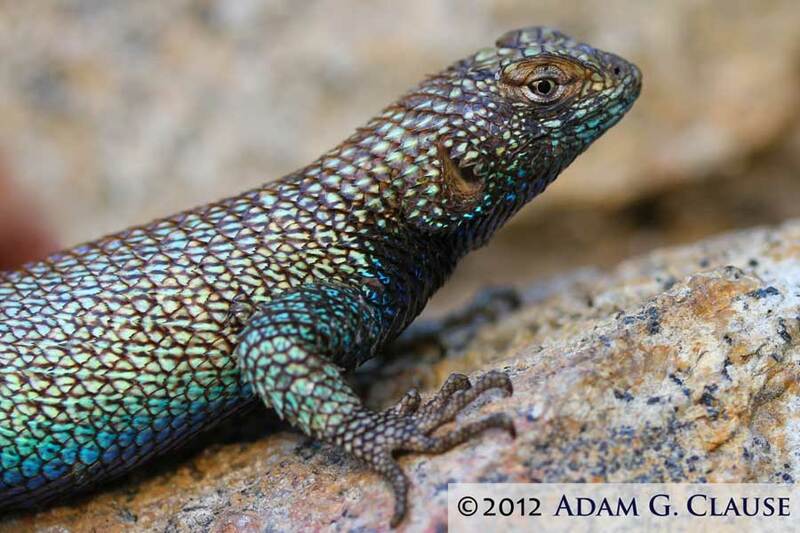 Males have blue on the throat and belly, and yellow and blue-green markings on the back and upper surfaces along with a wide purple stripe on the back. 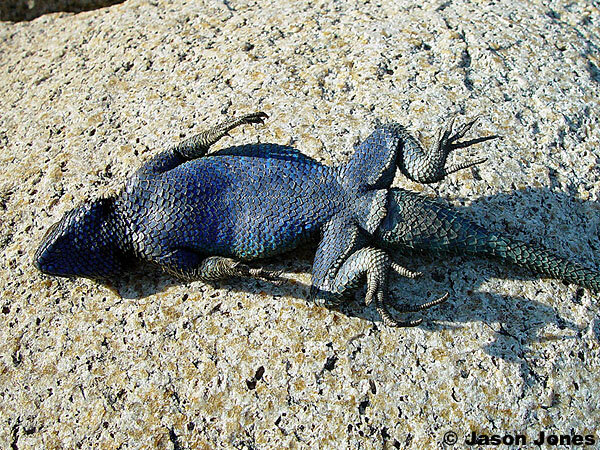 Some males appear to be blue all over the body. 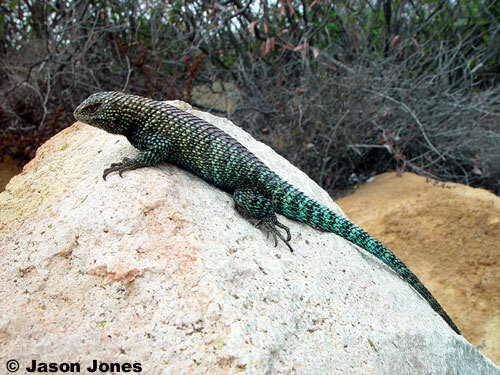 Males also have enlarged femoral pores and a swollen tail base. 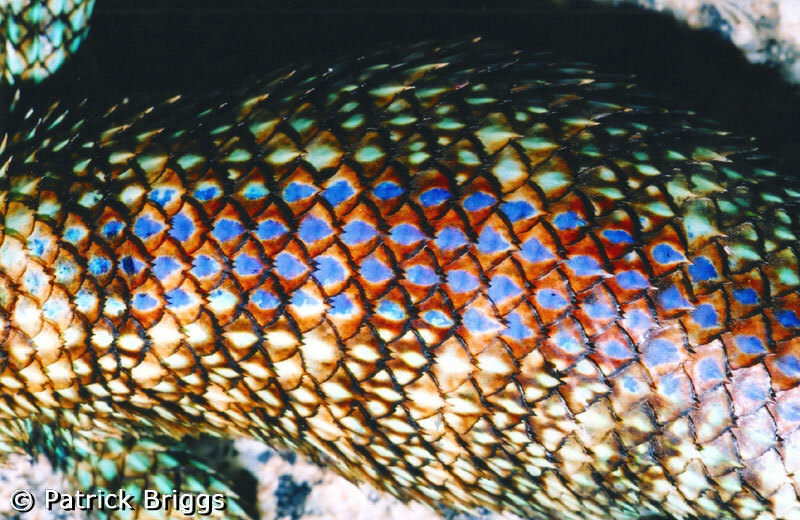 Females have more distinct crossbands than males and very little or no blue coloring underneath. 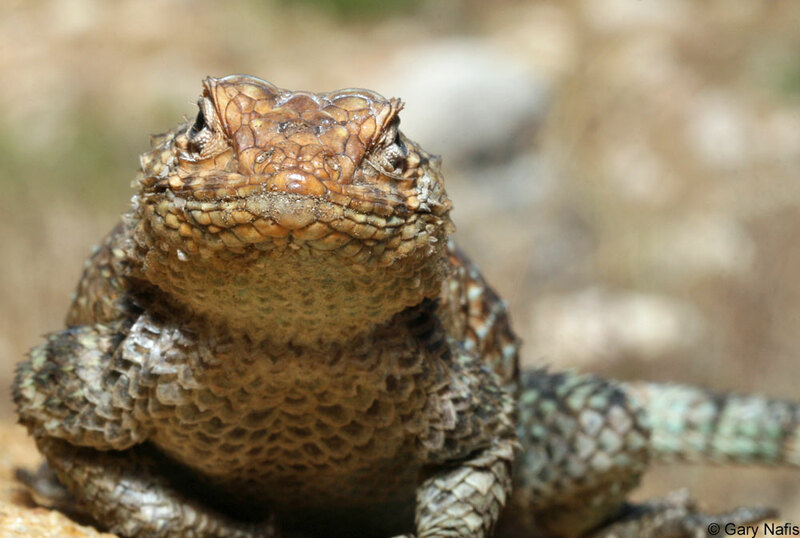 Young lizards have a rusty head and conspicuous bands and neck markings. 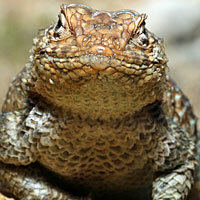 Active from spring to fall, sheltering in cracks in rocks or under surface cover, and remaining inactive during winter. 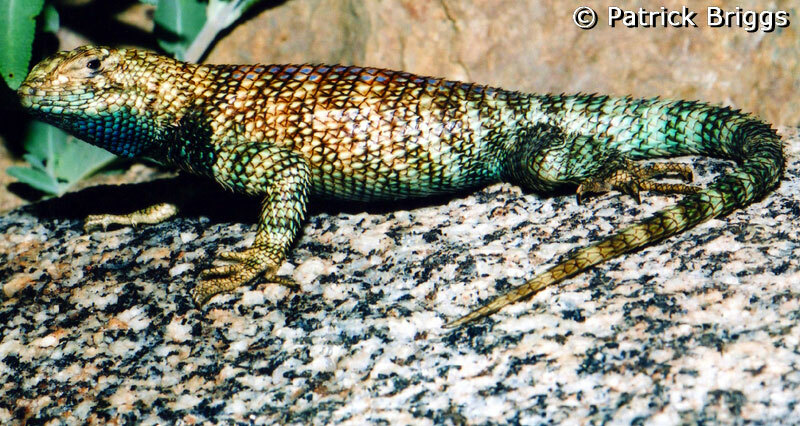 Typically seen basking on large granite boulders. 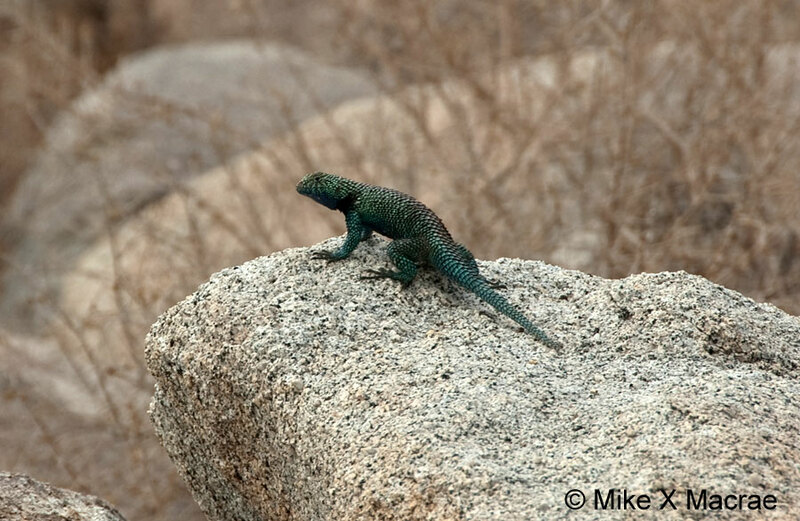 This lizard can be very conspicous when basking on light granite boulders, but it is very wary and capable of running quickly away from danger, often to the other side of a large rock. 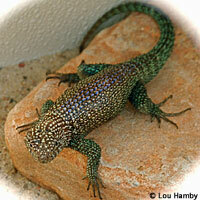 Eats small invertebrates, small lizards, and occasionally fruits and flowers. 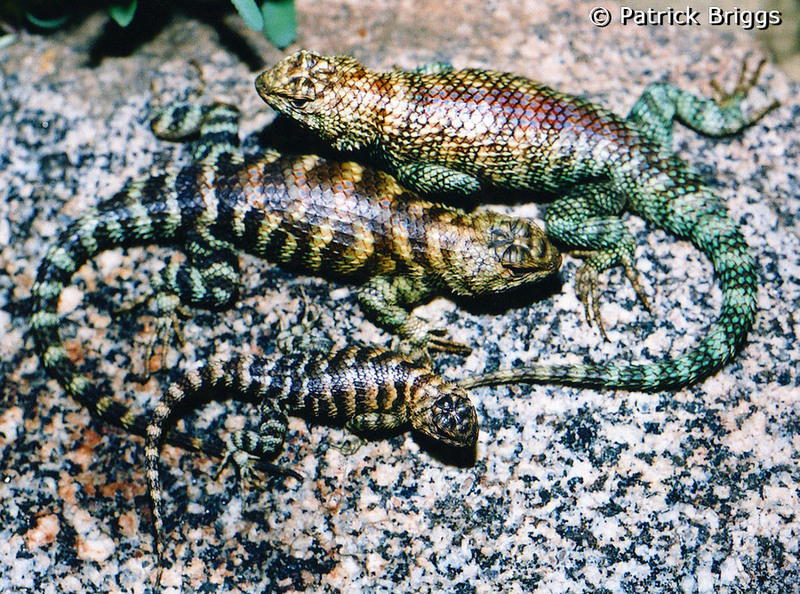 Mates in March and April. 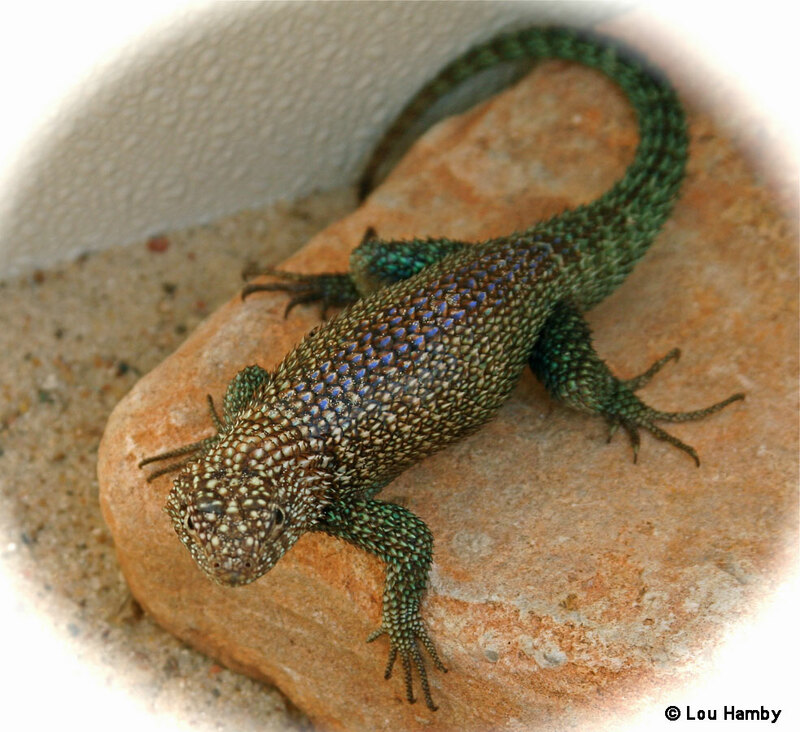 A clutch of 6 - 15 eggs is laid from May to July. Eggs hatch from July to October. 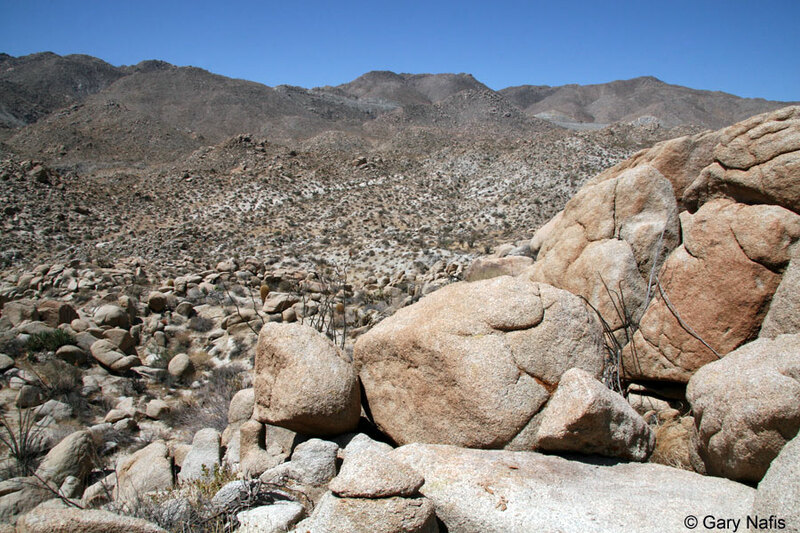 Inhabits areas with large boulders and granite cliffs with mixed vegetation, including chaparral, mesquite, pine and oak, and palms. 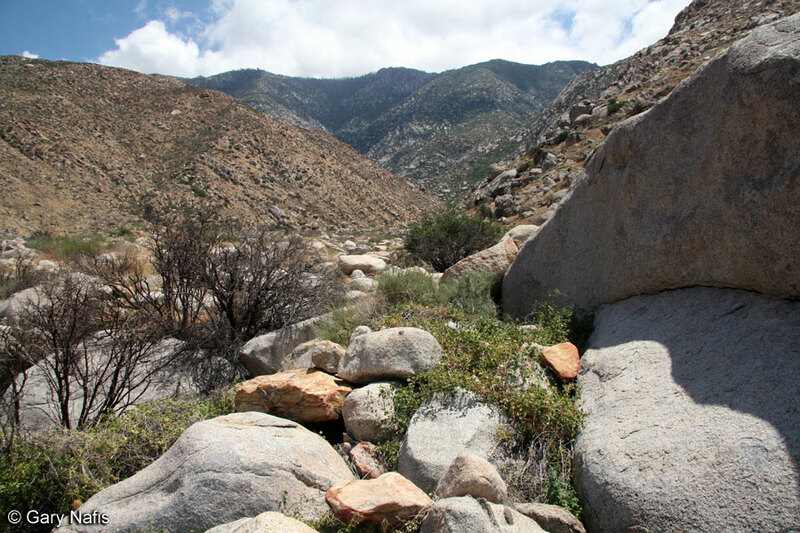 Ranges from the northern side of San Gorgonio Pass south along the lower slopes of the Peninsular ranges into Baja California where it ranges almost to the cape. 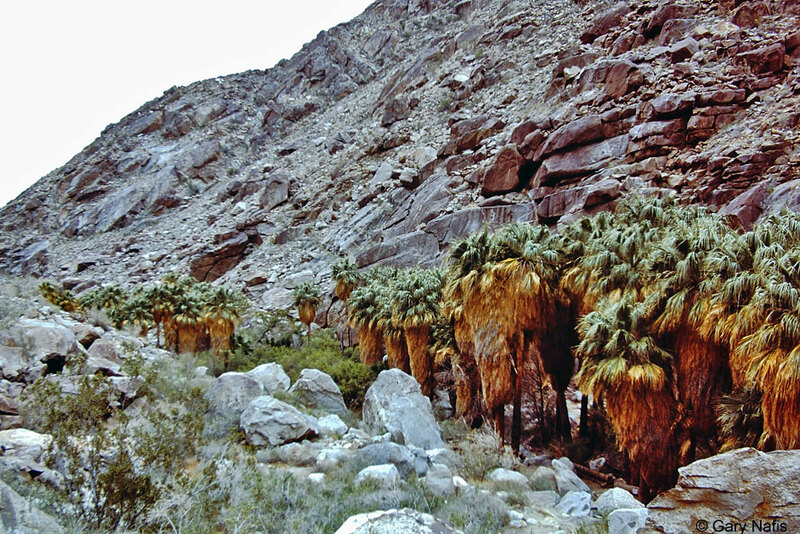 Found on the desert slopes of the mountains where there is sufficient plant cover, and on the coastal side inland to near the coast and north to the Santa Ana River. Elevation is listed as being from sea level to near 7,000 ft. (2,100 m) (Stebbins, 2003) but I have seen them as high as 7,800 ft. on Mt. San Jacinto, and I have received a reliable report that they occur at 8,740 ft. there, also. orcutti - honors Orcutt, Charles R.